All 23 World Class corps took the field head-to-head for one last time Thursday, Aug. 12, as the Blue Devils mirrored their previous first place standing, raising their score to 97.90 at Indianapolis' Lucas Oil Stadium for the World Championship Quarterfinals. "They did a tag at the end of the show which was bringing us back to the mirrors – it was an exclamation point on the show," said Blue Devils Program Coordinator and Color Guard Designer Scott Chandler while explaining a new addition to the corps' production. "'Through a glass darkly' is a very famous quote. It's about getting clarity. So the whole show is about going back and forth to the mirrors, trying to find clarity, always trying to see clearly. To find what you're searching for, whether that's yourself, or a new way of doing drum corps, or a new way of hearing music." But while the first position remains the same, other battles are taking place for 2nd, 7th, and 13th places, including an upset by the Cavaliers (2nd, 96.55). After being .4 behind one week earlier in Allentown, the corps worked to edge the Bluecoats (3rd, 96.25) by a mere three-tenths of a point Thursday night. "This sets us up perfectly for the rest of the week because we knew we wanted to move into the second spot if possible, and then we have two more nights to challenge the Blue Devils," said Cavaliers Director Adolph DeGrauwe. "Anything can happen in the DCI arena on any night, and we've seen that before. All the corps get better every single night as they go along, so our goal is to move on as quick as we can. From where we started at the beginning of the season to where we are right now is tremendous." While the competition heats up among the top 17 Semifinalists, six World Class corps performed with equal intensity at the Quarterfinals, marking their final competitive performances of the season. Though Pioneer (23rd, 73.95) took the last spot in the Quarterfinals competition, the corps is deservedly proud of its accomplishments in staying competitive while adhering to the tradition of training members from all backgrounds and skill levels. 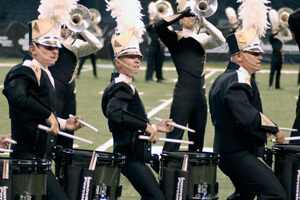 "We are a drum corps that will take any student and train them to become a world class competitor," said Pioneer Visual Caption Head Chad Quamme. "We don't have that luxury of having students walk in with the training and the knowledge. We take everyone and that makes us special, that makes us unique, and that makes us great." Pioneer age-out bass drummer Lukas Snyder, has no regrets on his final show with the corps he's marched with for five years. "The performance wasn't spot-on perfect but it was the culmination of everything we've gone through this year. It was everything I wanted to leave out on the field." 22nd-place finishers Cascades (74.60) concluded their season with the visually entertaining program "Silver Lining." Color guard member Thanh Pham was excited about the performance, enjoying the way the sound "echoed" through the stadium. Tuba age-out Will Obregon said the corps climbed "a steady hill up" in progress each day, with members persevering through hot weather and sometimes discouraging scores. "We never really hit a plateau, we just kept growing and growing," he said. "I saw more maturity and a willingness to attain new levels of greatness from the members." Jersey Surf (21st, 75.70), despite a decrease in score from one week earlier in Allentown, Pa., lost no points in the emotion behind its show. Drum Major Alison Baier, a fifth-year member of the corps, said: "It was the energy, it was the passion, it was the performance. It was so much fun. We had a blast!" 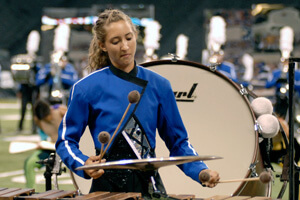 With five years under her belt with Jersey Surf, the minute Baier cut off the final note of the corps' Quarterfinals performance and of her drum corps career, she was ready to do it all over again. "I try not to get caught up in the moment standing on the podium," Baier said. "But as soon as it was over, I think that's what popped into my head, that it's over…I'll admit, I looked over my shoulder and I said, 'I want to do it again.' All I want to do is get back on the field. That's the beauty of it I guess." Taking 20th place was Teal Sound (77.80), besting three other corps in its first year in the World Class. 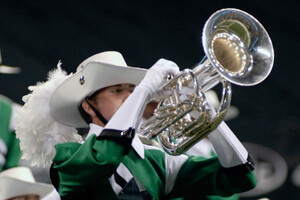 Guitar soloist Eric Wroblewski enjoyed shredding on the front sideline in his rookie year with a drum corps, listing his solo in the closer as his favorite moment in the show. Teal Sound has used electronics in previous years, and may be establishing an identity in its ability to utilize modern instrumentation in effective ways. 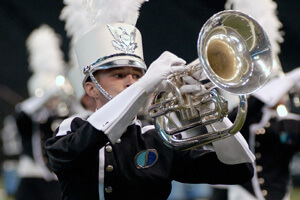 "Drum corps fans aren't used to [electronics]," Wroblewski said. "But a lot of people are starting to warm up to it." The Mandarins (19th, 78.10) ended up a little more than two points behind the 17th-place corps, Crossmen, with "To Dream of Faraway Lands." Corps Director Jim Tabuchi said this was the largest corps the Mandarins have ever fielded as well as the most experienced. 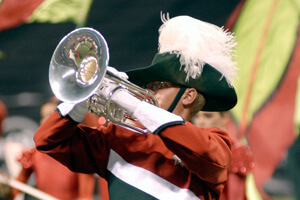 Baritone age-out Jared Cole celebrated his final show with the corps he spent five years with. 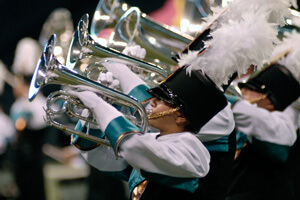 "It was not the best show I've been a part of in terms of cleanliness, but I feel like there is no way I could have had a show that really would have felt proper capping off my experience marching. It has meant so much to me and it has made me grow so much as an individual," Cole said. "The fact that it is all over, it's hard, but it's a happy moment too." Narrowly missing a slot in Friday's Semifinals competition was Pacific Crest (18th, 80.35), who finished fewer than .5 behind Crossmen and achieved its highest score since making the Semifinals in 2007. Color guard caption head Angela Tousley said members took "a really big step up" Thursday, rising to the occasion while dealing with the obstacles of an extended tour and sweeping color guard changes. "Members worked so hard to do the drill, choreography, whatever it took. They took it and went with it." Pacific Crest Trumpet age-out Eric Hemingway was excited about the corps being on the verge of Semifinals, and said it was his best season out of five with Pacific Crest. "I really liked how we really performed to the audience today and connected with people, really putting on a good show," he said. "We're pushing really hard to get to the next level." The Crossmen (17th, 80.80), after an upset courtesy of Spirit (16th, 82.85), narrowly made the Semifinals in one of the most difficult competitive years to date. The Troopers (15th, 84.20) stayed consistent, actually receiving the exact same score as their previous performance in Buffalo, N.Y. They're still caught in a close race with the Academy (14th, 84.250) and Colts (13th, 84.70). In the next grouping of scores, the Glassmen (87.15) are currently more than two points ahead of Colts, solidly taking its place in 12th – for now. 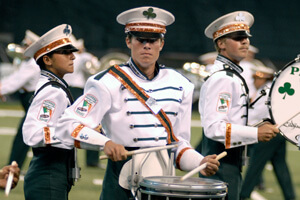 "I think it was really good for our first run in the [indoor stadium]," said snare drummer Nathan Hawk. "I'm excited to be back at Lucas Oil Stadium." Hawk said the corps' program was designed to sound better within the booming walls of the stadium. "[The Prayer Cycle] is a very different show for us conceptually. Orchestration-wise, I think it's a thinner, more feature-esque opener because of Lucas Oil," Hawk said. "So I think the show is better designed around the stadium, looking toward Finals. I think we're just trying to improve every night and get better, and end the season from how we wanted it from the beginning." Next was the second upset of the night, with the Blue Knights (11th, 88.40) switching places with Madison Scouts (10th, 89.15). 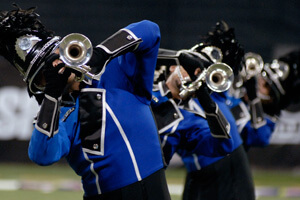 The Madison Scouts had only topped the Blue Knights one other time this season, August 3, in Massillon, Ohio. The Boston Crusaders held onto 9th place with a score of 89.75. In 8th place, the Blue Stars (91.65) closed the gap on Santa Clara Vanguard (7th, 91.90) to a mere .25 margin. Though in danger of falling in the rankings, Vanguard members are working as hard as anyone to clean up the last remaining details before their final performance. "I guess everyone knows the end is coming and they don't want to be any less than they can be," said Vanguard front ensemble member Matthew Geiger. "The past couple of weeks everyone's been trying really hard to bring out the legacy of the Vanguard." Geiger said this year's program contrasted greatly with the corps' 2009 program, "Ballet for Martha" due to darker, more discordant music. "Last year was really nice, pretty, beautiful, musical the entire time. And this year it's the exact opposite. We've got this really dark and terrible music, also beautiful in its own way, but you have to have a corps that can portray that. This year nobody's humming Bartok down the street, but I think people are starting to understand." Phantom Regiment (6th, 92.35) improved by more than a point from their last showing August 8 in New Jersey, once again taking top honors in the Percussion caption. The Cadets (5th, 94.45) also gained ground, but not enough to overtake Carolina Crown (4th, 94.85), who retook the edge after previously falling to the Cadets in Allentown, Pa.